Discussion in 'Amps/Cabs Tech Corner: Amplifier, Cab & Speakers' started by MrMedley, Jan 30, 2012. According to this pic of my blackbird 40 with tremolo, which pick is V1? Ive read it's usually the farthest away from the output tubes, but I'm not sure if it's the farthest away in line, or the one by itself behind the rest. Could that be just for the trem? 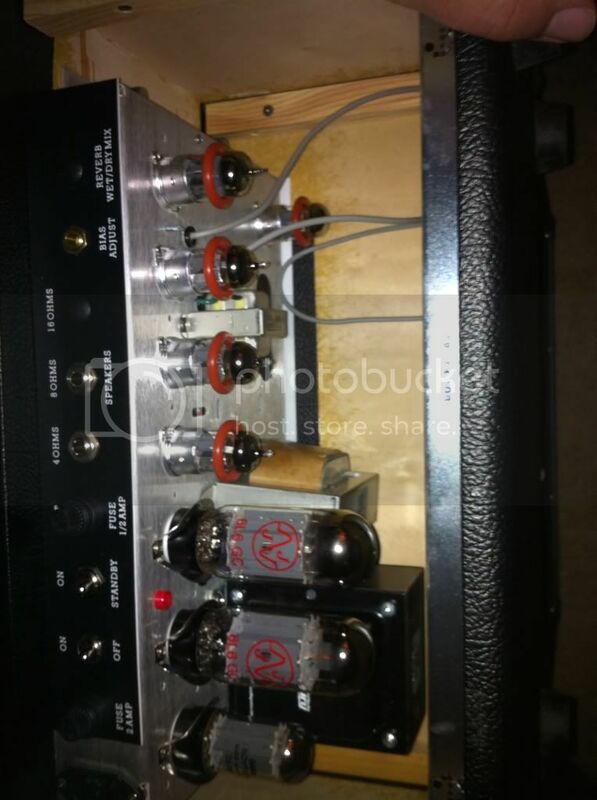 Also, the amp came with a cheap sovtek rectifier (I bought this amp used). How much does the rectifier affect tone? If I replace it, what should I go for brand wise? I don't know for sure, but it looks like V1, off behind the rest, mounted close to the input for less noise. I've seen Allen chassis setup like that. I'm unfamiliar with yours, but I'm pretty sure it's V1. My ears think rectifiers make a difference. Mullards are among the best, NOS or good used. Any of the older U.S. and U.K. and European NOS are good. Go to http://www.kcanostubes.com/ and look at price ranges to get an idea of quality range. Ok, thanks for the reply. Is there a way I can test for sure? I'm thinking of replacing v1 with a nice nos RCA but using current production for the rest. If it's right behind the input, I'd say you're good to go. If you take the chassis out, you should see the connection between jack and socket. I love RCA's in V1. Glad to help. I find the Rectifier is very important in most amps. although it doesnt produce tone persee/directly, it does regulate the voltage to the tubes that can indirectly have a huge effect on the tone itself. and a good NOS rectifier can make an amp sing!